Welcome to Scenic City Signs! 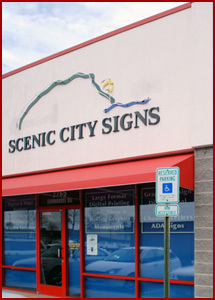 Welcome to the grand opening of Scenic City Signs' brand new feature: The Blog that Speaks for You. Here we'll be providing you, our readers, with the tips, tricks, and dirty little secrets of the sign industry that you can use to improve the quality of your presentations, develop a professional appearance for your company, and -- yes -- increase your business. You'll also learn pretty quickly that your writer is a fan of awful puns, hence his snazzy handle of "Signtern." If any of our other employees decides to make a contribution, he'll prod and poke them into making a username just as lame. Oh yes he will. He's Your Signtern because he's here to answer any questions you might have. Just drop a comment on one of our blogs and he'll answer you as best he can. Check back regularly for updates. Hope to see you here!